The discovery of the role of telomeres in controlling cell division has led to extensive research into its potential application to treat cancer and as a powerful new prognostic indicator. Detection of telomerase activity could potentially be used as a marker for cancer. A correlation between the severity of breast cancer and increased telomerase activity has been observed. This suggests that surgeons might be able to use a telomerase test to determine whether cancer is present or has recurred and also to assess the severity of the cancer. It would then be possible to assign the appropriate treatment to the patient. A low level of telomerase activity in a tumour could imply that by exclusively removing the lump, the tumour might be successfully treated. If a higher level of telomerase activity were to be detected in the tumour, the patient might respond better to a masectomy and chemotherapy. Telomeres, telomerase and the regulation of telomerase activity offer a wide variety of potential therapeutic targets. [18,22, 23] The inhibition of telomerase has been proposed to limit the growth of cancer cells by triggering telomere shortening and cell death. Hence laboratories around the world are actively exploring a vast array of exciting possibilities directed towards devising and testing molecular therapeutic strategies focusing on the inhibition of telomerase. It is not yet clear how the existence of telomerase in cells is controlled. Especially since telomerase comprises of two components, multiple proteins and is encoded by many genes; all of which have yet to be identified. The active site of hTERT. These principle approaches are all the subject of current investigation and their sites of intervention are indicated on the picture below. 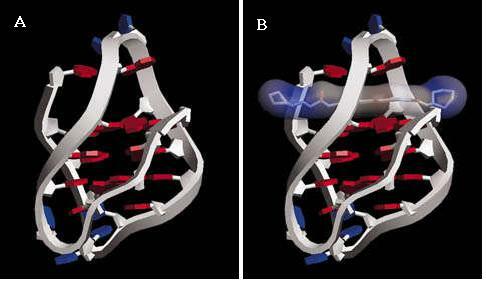 The latest and most promising of these is the stabilisation of G-Quadruplex DNA. In principle these anti-telomerase therapies should selectively affect only tumour cells and not normal somatic cells. It has however been shown that the inhibition of telomerase activity leads to a modulation in the growth rate of cancer cells without disturbing the function of the surrounding cells. The normal human cells that naturally express telomerase such as a germline cells and stem cells must also be considered. By inhibiting telomerase within the body, there is a potential danger that undesirable side effects might occur within these normal cells. These effects are believed to be minor, because in comparison to cancer cells, the telomeres that exist in these cells are much longer. In addition the reproduction of these cells is erratic. 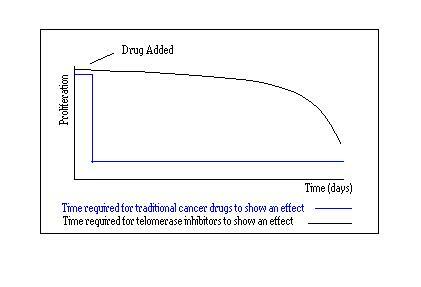 Telomerase inhibitors should not therefore show the same toxic effects as conventional drugs, especially if they require long-term registration. This is the reverse of the traditional approach to cancer chemotherapy. Nevertheless it is only through the development and testing of such inhibitors that potential drugs may be discovered. In the following section some of these approaches will be discussed. Some research has concentrated on the regulation of these genes for hTR and hTERT. It has been shown that the mechanism for the elongation of telomeres is dependant on the sequence of the hTR template. By mutating this template, any subsequent addition of nucleotides to form the new telomeric repeats will show a corresponding mutation. In this manner the telomere tips also become mutated, hence destroying the characteristic catalytic binding site of hTERT. Without this catalytic function of hTERT, the cells progressively lose DNA and undergo senescence. Recent investigations have fused immortal cells expressing telomerase, to normal cells lacking telomerase. The resulting hybrid cells showed a repressed activity of telomerase and eventually resulted in the termination of cell proliferation. It is probable that the loss of the specific proteins associated with telomeres could lead to the recognition of the chromosome ends as broken DNA. The depletion of TRF2 from the telomeres has been shown to cause the loss in telomere overhangs and result in growth arrest without telomere shortening. Consequently high rates of fusion were observed and apoptosis induced. The hTR gene is expressed in both normal and cancer cells, it is therefore unlikely that regulating hTR would be a key way of controlling telomerase activity. It has however been observed that an increase in the expression of hTR in cancer cells, results in increased telomerase activity. Although hTERT, TRF1, TRF2 and Pot1 are all important in the control of telomerase the activity, it appears as though the hTERT is the preferred target. This is because it is only hTERT that is NOT expressed in telomerase negative cells and that is also only hTERT that is limited specifically to the cancer cells of tumours. Several studies have shown that by introducing a negative form of hTERT into tumour cells, apoptosis results. Thus the tumour cells loose their characteristic ability to proliferate. As described above in "What is telomerase? ", the 11-base template, CUAACCCUAAC, within the hTR component recognises and binds easily to the telomere end. This is essential in the maintenance of telomeric DNA, thus leading to the suggestion that an ideal solution would be to inhibit this sequence using specific oligonucleotides,[25, 33] which are short fragments of DNA. The bases of these oligonucleotides are complementary base-pairs to the corresponding bases of the active site of telomerase. The hTERT active site binds preferentially to the oligonucleotide rather than the hTR active site, thus in this way the functioning of telomerase is prevented. This was one of the first effective approaches to the inhibition of telomerase. Although the approach has proved successful in telomere shortening and the onset of senescence, it unfortunately still has disadvantages common to an antisense strategy. These include difficulties in uptake, distribution and cost. 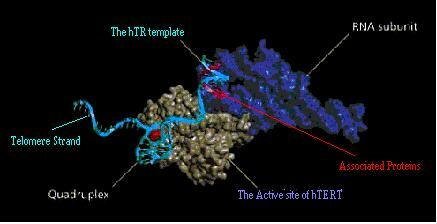 Inactivation of the hTERT component has been achieved by inhibition of the catalytic residues at the active site. 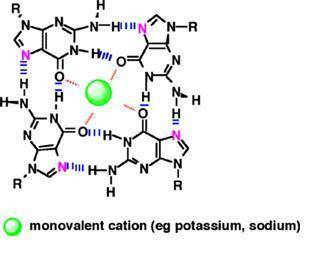 Originally this was accomplished using a variety of oligonucleotides, although their selectivity tended to be poor. Non-nucleotide compounds have now been designed that also act as catalytic inhibitors of hTERT active site. These small molecules are potent inhibitors and demonstrate telomere shortening and an anti-tumour effect. Although the anti-telomerase drugs have been found to work in principle, it is unlikely that many of these agents that inhibit telomerase, actually interact specifically with telomerase. It is far more probable that these treatments induce many changes that include decreasing the expression of telomerase. In order to confirm that the success of such inhibitors is due solely to their direct interaction with telomerase, the following criteria should be filled. Lead to the eventual shortening of the telomeres being observed. Cause a decrease in cell proliferation. From the results of drugs tested thus far, it has been suggested that telomerase inhibitors might not be well-suited as a primary treatment for cancer. It has been shown that the onset of cell death actually correlates with telomere length, thus tumours possessing short telomeres die before those with long telomeres. Therefore these cures might actually only be effective in tumour cells that have short telomeres. Another disadvantage of telomerase inhibitors is due to the extensive delay that is required before any detrimental effects on the cells occur and a change in cell proliferation is observed. On average a cell will have to divide 50 times before the initiation of senescence and subsequent apoptosis. This results in such drugs taking close to 100 days to show any effect on tumours, therefore these drugs would not always be a viable option. Fortunately other strategies exist for targeting telomeric stabilisation apart from telomerase inhibition. Direct inhibition of telomere maintenance is one of them and is a rapidly emerging area in the hunt for a new primary cancer cure. The telomerase enzyme complex requires the end of the telomere to be single stranded in order for effective binding to occur between the two telomerase components, hTR and hTERT. In tumour cells, the t-loop structure has to be at least partly unravelled before the telomerase can initiate extension of the telomere. Therefore folding the extreme end of the telomere into a more complex structure, would perhaps induce the hindrance of telomere lengthening. This is indeed the foundation for the current research in this area. This approach is based upon the assumption that the single-stranded G-rich regions at the telomere ends would form G-Quadruplex structures. The ability of the guanine-rich sequences of telomeric DNA to self-associate is well established. The arrangement that is formed is called a G-tetrad. Four nucleotide strands are involved in a G-tetrad, with one Guanine from each strand participating in a hydrogen bond. Successive layering of 2 or more G-tetrads forms a box-like structure with a central cavity, this structure is called a G-quadruplex. Positively charged metal ions can be sandwiched between the tetrads. Their presence in the central cavity of the quadruplex helps to maintain the stability of the structure. [34,35,38] This was first demonstrated by showing that a potassium ion, K+, inhibited telomere activity by folding the DNA into a G-quadruplex structure. The structure of the G-quadruplex can involve just one or two telomere strands looping back on themselves or four separate telomere strands. 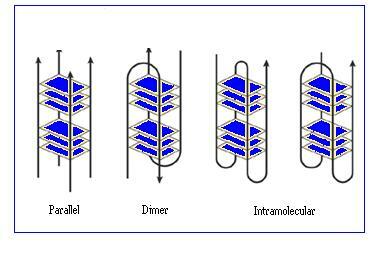 In each case, the four strands are able to associate together in various ways to produce a variety of quadruplex structures. Detailed studies carried out on these structures using X-ray crystallography and NMR have shown that depending on the number of different associated strands and on their respective orientations, both parallel and anti parallel arrangements can be seen. Folding the telomere into a G-quadruplex structure could inhibit cancer because the G-quadruplex structure must first be unfolded in order to render the telomere end accessible to the telomerase enzyme. It is therefore thought that if telomeres could be stabilised using such a structure, that the cells could be prevented from the infinite proliferation characteristic of cancer. A telomere end folded into a G-quadruplex structure can be stabilised by stacking certain small molecules onto the ends of the G-tetrads. Conclusive evidence for the formation of these unique G-quadruplex structures within human cells was provided last year and has led to a rational search for small molecules that can selectively interact with G-quadruplexes and stabilise the structure. Different classes of molecules have been shown to inhibit the unravelling of the complex G-quadruplex structures through their interaction with the G-quadruplex DNA. On the basis of observations that potassium ions can stabilise these structures, small molecules that mimic their effect have been designed and found to inhibit telomerase activity. After the original discovery of G-quadruplex interactive telomerase inhibitors based on anthraquinone; a number of other compounds have been identified. These include the fluorenones, bi-substituted acridines and cationic porphyrins shown in Fig 17. The first demonstration of telomerase inhibition by a G-quadruplex-interactive molecule in living cells was using an anthraquinone. 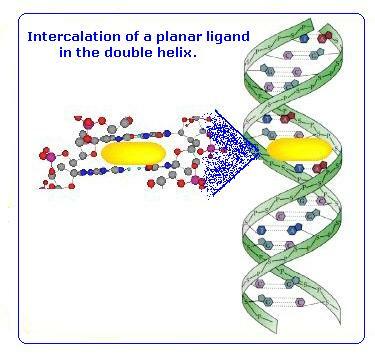 NMR studies showed the molecule to have a moderate preference for binding to quadruplex DNA(four strand structure) over duplex DNA (two stranded structure). This is a vital characteristic in order to avoid toxicity in the body. Experiments have also shown the molecule to almost completely inhibit the action of telomerase. Together these observations suggest that the interaction of anthraquinones with G-quadruplex structures could be used to inhibit telomere maintenance. Since then a wide range of these anthraquinone based molecules have been developed. (a). A model of G- quadruplex DNA structure; (b) binding to an anthraquinone. A correlation between the quadruplex binding affinity of a wide range of these molecules and telomerase inhibition has been demonstrated in several studies using human telomeric sequence. If G-quadruplex stabilisation is in fact the primary mechanism by which inhibition of telomerase is occurring, inhibition should only take place when the telomeres are 5 or more repeat units long. If the telomeric DNA is any shorter than this, it is not possible for the strand to form a G-quadruplex structure. Therefore, if any significant inhibition is observed when the telomeres are shorter than this, inhibition must be occurring via another mechanism. By testing the effects of G-quadruplex-interactive molecules on telomeres of increasing length, it was confirmed that the main mechanism of telomerase inhibition was indeed G-Quadruplex stabilisation. In the presence of anthraquinone, significant inhibition of more than 50% was observed for telomeres that were 5 or more repeat units long and thus capable of forming a quadruplex structure. For telomeres of shorter lengths, the presence of anthraquinone had little effect on the inhibition, since quadruplexes could not be formed. In order to allow intercalation of the stabilising molecule into the cavity between the tetrads, distortion of the quadruplex must occur. The G-quadruplex is an extremely stable and rigid structure and therefore this distortion is not favoured. An alternative model for the binding of these G-quadruplex stabilising molecules, is the stacking of the molecule on the outside of the tetrads. This avoids the need for any distortion of the structure and is far more favourable. The initially designed compounds showed severe flaws. Not only did they show relatively poor selectivity for binding to quadruplex DNA over double helices, but they were not particularly potent telomerase inhibitors either. Rational design of compounds using molecular modelling has allowed the unique structural features of G-quadruplex DNA to be exploited. Unlike direct inhibition of telomerase, this method has bought about a more generalized approach that can be applied to both telomerase positive cells and those that use ALT. Although both the G-quadruplex inhibitors and the direct-acting telomerase inhibitors have been shown to inhibit cell growth and induce senescence, a great contrast was that G-quadruplex inhibitors caused no toxicity. The toxicity of this method is low due to the selectivity of the molecules for binding to quadruplex DNA over duplex DNA. One of the main advantages of this method over conventional telomerase inhibition is that G-quadruplex inhibitors might not require an extended period of time before any significant effect takes hold. As previously mentioned, the activity of telomerase inhibitors is only evident after about 100 days. In the case of G-quadruplex stabilisation, significant anti-tumour activity was seen after only one month. Extensive telomere shortening is not required for the initiation of a biological response to the quadruplex stabilising molecule. Inhibition by quadruplex ligands is driven by the presence of the shortest telomeres which are especially sensitive to this technique. It is therefore not only a selective technique but the accomplishment of cell growth inhibition and ultimately senescence is relatively rapid in comparison to telomerase inhibitors.